This is a short interesting humorous story about a donkey and a potter. You will find it interesting and you will also know that how an imaginary rope has played an important role in the story. It is very much funny to see that donkey and an imaginary rope is fully correlated with each other. Once in a small village, there lived an innocent potter with his family. 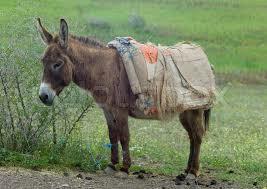 He too had a donkey on which he used to carry the soil from the field everyday to his house. Since the field was very far away from his house, he used to take rest under a shady tree in midway. He too ties his donkey with a rope nearby so that the donkey may not escape easily. But one day the potter had forgotten to carry the rope with him that he uses to tie the donkey. When he reached to the shady tree far away from his house, he realised that he has forgotten to bring the rope with him and if he left the donkey free, the chances are there that donkey may ran away easily. He started thinking that “How should I tie the donkey today as I didn’t bring my rope?” he might easily escape if I had a nap. Then the potter decided to hold the ears of the donkey continuously till he had a nap. But in this way both were not comfortable, the donkey started having pain in its ears and also the potter was getting tired holding its ears continuously for longer time. A saint was passing by from there and saw the potter holding the donkey’s ears. Then saint went to the potter to see what the problem of the potter is and asked him why he is holding the ears of donkey. When the potter explained the problem to saint, then the saint replied “Take your donkey to the place where you used to tie him daily and tie him”. Potter didn’t understand that how without using rope a donkey can be tied. The saint explained him Pretend to tie the donkey using an imaginary rope. I assure that the donkey will not run away. Finally the potter did as he was instructed by the saint. Read further to know that what had happened next in this short story. The potter left the donkey pretending to tie using an imaginary rope and went to take a small nap. When he woke up he was shocked seeing that the donkey was standing in the place where he was tied. Soon the potter prepared itself for leaving to home. But the donkey didn’t move. He tried many yet times to make him mover but was failed. Then he thought “what’s wrong with this donkey?” “Why the donkey is not moving?” the potter exclaimed in frustration. Luckily he saw the same saint again passing from there and he immediately ran towards the saint and asked you told me to tie the donkey pretending an imaginary rope. But now when I am prepared to leave for my home, he is not moving. Then the saint replied, “You have tied the donkey pretending an imaginary rope but you had forgotten to untie the rope and that’s the reason why the donkey is not able to move”. Just go and get the rope untie and leave for your home. The potter had followed the instructions given by the saint. Now the donkey can move easily. He was totally surprised to see this. He was not able to understand is this a miracle or its donkey is really donkey only. The potter thanked the wise saint and went to the house with its donkey happily. So I hope that you have well enjoyed reading this short humorous story. Soon we will be there with more such short stories.